Although I love the look of the clay pots, this dish could be cooked in any small oven-proof dish with a lid, or even covered with foil if you don’t have a lid. This dish takes only minutes to throw together, then cooks in the oven for about an hour. Because of the fragile nature of of the clay pots, you should not preheat the oven prior to putting the dishes in; you let the pot gradually come to temperature as the oven heats up. If you are using a regular ovenproof casserole dish, you could reduce the cooking time a bit by preheating the oven while you assemble the dish. 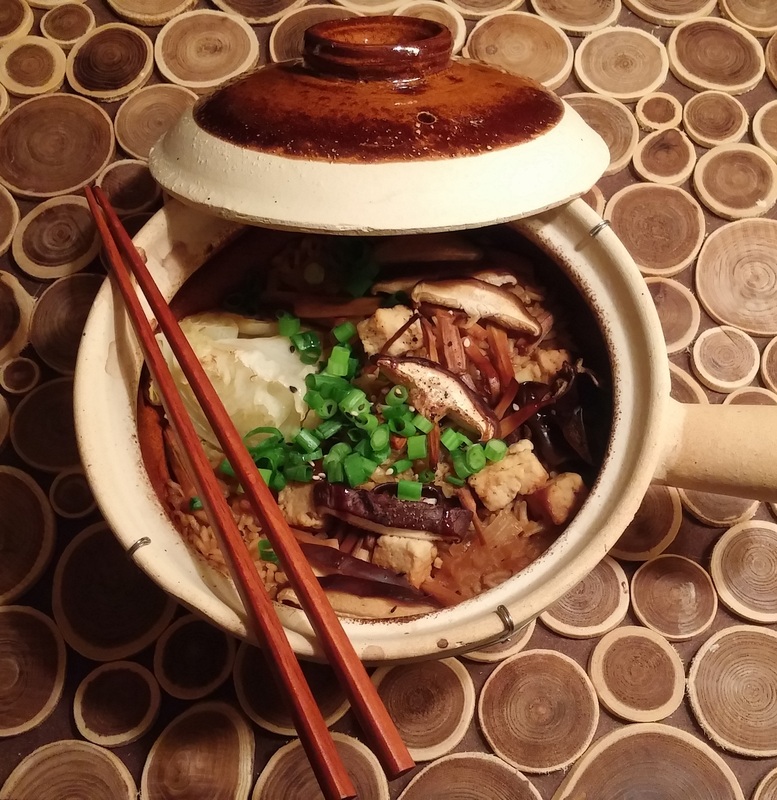 This dish utilizes some specialty ingredients from the Asian market: dried woodear mushrooms, dried lily flowers, and Shaoxing rice wine. 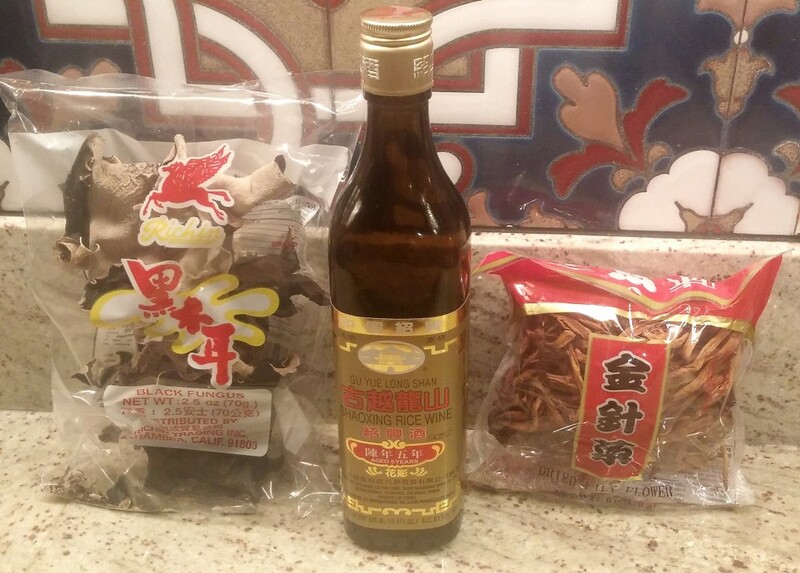 You could omit the dried lily flowers and replace the Shaoxing wine with sake or dry sherry. You could also replace the woodear mushrooms with more shitakes, but you would miss out on the interesting texture and wonderful aroma that they provide. They are readily available at any Asian market or a well-stocked supermarket. I find that they are usually labeled “Black Fungus”. Keep in mind that they expand A LOT when they are re-hydrated, so use less than you think you need. A delicious, healthy and easy one pot meal that showcases mushrooms beautifully and compliments them with delicate flavors. Rehydrate dried mushrooms and lily flowers (if using) in 1 cup of boiling water. 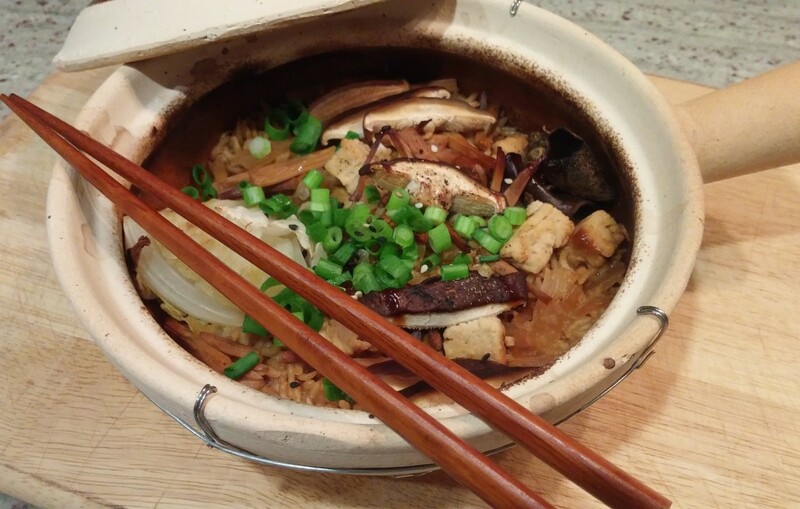 In your clay pot or casserole mix: rice, broth, sugar, rice wine, soy sauce, oyster sauce, garlic and ginger. Place sliced shallot and cabbage on top of rice. Season chicken or tofu with salt and pepper and lay on top of the rice. Arrange mushroms and lilyflowers around and on top of chicken. Cook for 45-60 minutes until rice and chicken are cooked through. Garnish with chopped scallion, sesame oil and sesame seeds (if using) and serve with extra soy sauce.